Personally, I have never been a fan of jewellery on men. Terms such as ‘mewellery’ and ‘mangles’ literally send a cold shiver down my spine, but I am now beginning to see that even if you don’t buy into the hideous terminology, you can successfully buy into the trend. Throughout 2012 and 2013 we have seen bracelets take off and develop into a go-to accessory for style-conscious men. From wooden beads to leather cuffs to metal ID bands, there is currently a wealth of options available to choose from, for those men who aren’t afraid to confidently adorn their wrists. However, 2013 seems to be the year where the tide is turning and men are becoming more open to the idea of using bracelets. According to Toby Bateman, Buying Director at Mr Porter, sales of men’s bracelets are surging, whilst The Times also reported a rise in men’s jewellery sales during 2012. Not only that, the fashion press, including GQ and Ask Men, have supported this emergent trend with several articles and editorials featuring wrist wear for men. Shortlist magazine have been particularly vocal advocates, recently featuring a ‘Buyers Edit’ section with Harvey Nichols’ Head of Menswear, Darren Skey, who picked out an M Cohen oxidised silver and vintage Hermès silk bracelet as his accessory of the season. Furthermore, flicking through the recent AW13 edition of Shortlist MODE, advertorials from brands such as Ralph Lauren, Topman and Replay feature models wearing bracelets, proving that it is a trend being pushed by both high-end and high street brands alike. The same edition of Shortlist MODE also includes an entire editorial spread entitled ‘Way Up High’, which shows the model in a range of rural, outdoor locations. In every shot he is wearing a small stack of bracelets, which not only adds to the ethnic theme of the shoot but gives each look a sense of character and individuality. With all this in mind, for the average man who is interested in exploring the world of wrist wear, what are the key styles available this year? Metal bracelets – specifically ID bracelets – probably represent the most masculine wrist wear option, largely due to their military connotations. Metal bracelets have long held a place within men’s style, with screen idols such as Marlon Brando and James Dean (see lookbook below) wearing them in commemoration following the Second World War. Their popularity is also on the rise today, with celebrities such as Michael Fassbender, Channing Tatum and Liam Hemsworth spotted wearing them recently. ID bracelets retain a sense of masculinity and convey a notion of tasteful rebellion with their sleek appearance. As they tend to be quite distinctive and chunky, metal bracelets are best worn as standalone, solo pieces. For this reason, it is also a good idea to wear it on your free, non-watch hand, rather than weighing down the same wrist with both your watch and metal bracelet. There is the argument that metal bracelets can slip into women’s ‘bangle’ territory, but conversely, Esquire magazine recently included a stylish metal cuff in a feature entitled ‘The 10 Best Things To Wear On Your Wrist’, demonstrating that a slimline metal cuff is a versatile piece a man can successfully pull off without appearing feminine. As with everything, it’s important to wear with confidence and – especially with metal bracelets – work under the concept that less is more. No one wants to give off the appearance of a manacled prisoner. The nautical aesthetic has cemented itself within the very core of menswear, so it comes as no surprise that this influence has recently been applied to jewellery. A perennial trend each and every spring/summer, investing in a nautical-themed bracelet therefore offers longevity and is the perfect finishing touch to any maritime or Riviera-inspired outfit. The nautical concept has been applied to wrist wear in several different ways in recent seasons, from type of fastening, to the use of rope and cabling, to the inclusion of nautical-themed motifs and emblems. For example, the current Miansai collection available at Mr Porter contains a plethora of sophisticated nautical-themed pieces, which all come complete with anchor/hook fastenings in sleek silver, brass and gold. I particularly like the Miansai Leather and Metal Anchor Wrap bracelet, which juxtaposes a soft tan leather multiple wrap with a stunning silver anchor pendant that doubles up as the fastener. At the slightly more affordable end of the market, Topman are offering a double rope bracelet with a marine-themed badge closure, and Urban Outfitters are stocking a beaded bracelet featuring a silver anchor piece cleverly embedded in a rock-effect stone. When researching this article and gathering images from recent street style photography, it seems one bracelet style is currently head and shoulders above the rest, in terms of popularity: the beaded bracelet. From ethnic-inspired wooden beads to high-end crystal/ebony versions to statement plastic styles, the range of designs currently on offer is vast and provides something for every personal taste. A large part of their appeal stems from the fact that you can effortlessly stack a variety of styles together to create a look that is completely unique to you. Alter size of bead, material and colour to create your own individual combinations, whether you opt for timeless and monochrome or bold and statement-making. They are also versatile enough to adapt to a wide variety of looks. For example, black and greyscale beads will give smart, tailored outfits an edge whilst wooden versions offer a natural, outdoors charm to heritage ensembles. In terms of technique, beaded bracelets can be used to inject an unexpected pop of colour into an outfit, tie together the palette by picking out subtle colours within the look (try matching to the base tones of your plaid shirt/blazer) or simply add another tactile element to an already carefully layered autumn/winter ensemble. Men are already accustomed to wearing leather on their wrists in the form of watch straps, so a leather bracelet is perhaps not such a big leap and may be slightly more appealing, especially for those taking their first tentative steps into the world of jewellery. The positive aspect of a leather bracelet is that it retains a sense of masculinity. Leather as a material is also refined and versatile, so – depending on the style and size of the bracelet – it can retain a sense of formality whilst at the same time appearing roguish and rebellious. 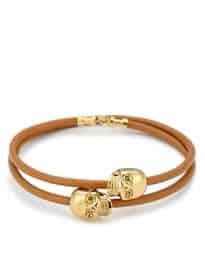 For example, a black or dark brown leather bracelet can be integrated into a smart, tailored look without jarring and, similarly, a wide leather cuff could be worn with a t-shirt and slim-fit jeans for a more edgy, rock ‘n’ roll aesthetic. Conversely to metal bracelets, leather versions can complement and contrast nicely against timepieces (whether leather, fabric or steel bands), which means you are also given the freedom to choose which wrist you wear them on. The woven bracelet is another style that is currently experiencing a resurgence in popularity, and they are often found in leather. The good thing about a woven bracelet is that fabric versions can be relatively cheap and come in a wide range of bright colours, should you want your accessory to pop and act as a point of reference for the whole outfit. Again, woven bracelets can be stacked and even combined with leather or beaded versions to create an interesting, visual effects without becoming too scruffy and unkempt. In fact, whilst researching this article the woven variety appeared to be the second most popular style (after beads) and were worn by all different types of men – from young street style muses to more mature professionals. So there we have it, proof that bracelets can be a stylish, considered accessory choice for the modern gent. Of course, there will always be naysayers and critics but, as with all controversial fashion choices, generating a bit of debate seems to only increase the popularity of a trend. As always, we want to know what you guys think. Are you already a keen bracelet wearer? Or do you shy away from jewellery altogether in order to avoid creating fussy, overdone wrists? Is there one type of bracelet that you feel deserves more recognition than any of the others? Is this the season you are going to finally give wrist wear a go?